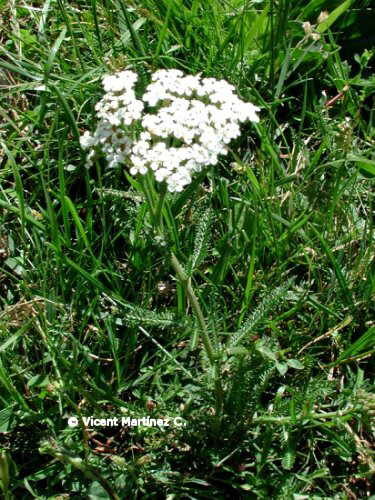 Photo of Achillea millefolium L.
Perennial plant of the Daisy family -Compositae- up to 60 cm. Erect stems, hairy, grooved. Upper leaves till 15 cm, twice or three times pinnate, lanceolate, sessile. Lower ones till 25 cm, petiolated. Flowers about 6 mm in heads, gathered in corymbes. By the side of the roads, meadows and grasslands.